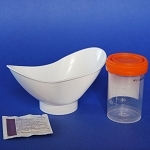 Specimen cups are used to collect either urine or oral fluid (saliva) samples. Each cup can hold up to 90ml of fluid, and includes a temperature strip to ensure the sample is not adulterated (the specimen is body temperature). The cup includes a label to record the sample information and comes sealed and sterile.